Marvin F. Erdmann, 91, a resident of the town of Rhine passed away peacefully with family beside him at his home on Sunday evening, March 31, 2019. Marvin was born on February 12, 1928 in Forestville, Wisconsin a son to the late Fredrick and Erna (Boness) Erdmann. He attended Maplewood School and graduated from Sturgeon Bay High School. After high school he enlisted in the Army and served during the Korean Conflict. On August 1, 1953 he was united in marriage to Bernice Erickson at the First Methodist Church in New London. They made their home in Two Rivers, Neenah, Omro and eventually moved to Elkhart Lake to be closer to family. Bernice preceded him in death on February 12, 2013, Marvin’s 85th birthday. Marvin had been employed as a lineman for Wisconsin Bell. Marvin was a handyman enjoying farming, gardening, woodworking, tinkering with automobiles and learning the technology of the computer age. Marvin was a member of Grace Lutheran Church, Elkhart Lake and was active in many capacities serving as treasurer and trustee and a member of the Caring and Sharing committee. Marvin also served on the finance committee at Grace Lutheran Church, Omro and was a trustee at Grace Lutheran Church in Neenah. 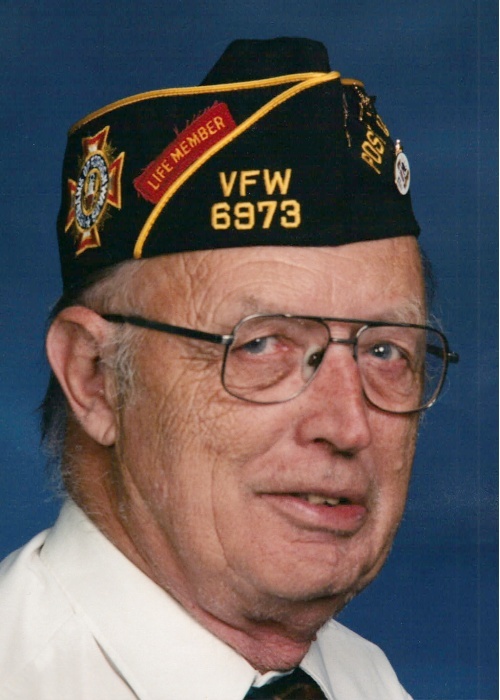 In addition, Marvin was a member and Quartermaster of the Elkhart Lake-Glenbeulah VFW Post 6973. Marvin is survived by his daughter, Andrea (Kevin) Byrnes of Princeton; his daughters-in-law, Julie Erdmann of Plymouth and Dee Ann Erdmann of Oshkosh; his seven grandchildren, Ayla Erdmann of Milwaukee, Mariah Erdmann of Plymouth, Kelly (Kate) Mueller of Plymouth, Shawn (Patty) Mueller of Plymouth, Malinda Mueller of Milwaukee, Emily (Zach) Kaiser of Menasha and Andrew Erdmann of Oshkosh; his six great grandchildren, Elayana Mueller, Alivia Mueller, Harrison Kaiser, Nicella Kaiser, Hans Mueller and Henry Mueller; his two sisters, Doris Mueller of Two Rivers and Mariann Kuntsman of Shoto, WI and a sister-in-law, Diane Erdmann of Green Bay. Nieces, nephews and other relatives and friends further survive. Along with his wife and parents he was preceded in death by two sons, David Erdmann and Michael Erdmann, a brother Dale Erdmann, a sister and brother-in-law Irene and Danny Leclair and brothers-in-law, Ken Mueller and Adolph Kuntsman. A funeral service for Marvin will be held 11 AM, Tuesday, April 9 at Grace Lutheran Church, 210 Lincoln St., Elkhart Lake with Rev. Peter Peitsch, pastor, officiating. Burial will be in the Garden of Valor at Greenlawn Memorial Park with military rites accorded. Family and friends may gather at the church on Monday evening, April 8 from 4 PM until 7 PM and on Tuesday morning from 10 AM until the time of service at 11 AM. Memorials in Marvin’s name are preferred. Marvin’s family would like to extend their grateful and sincere appreciation to the staff of Heartland Hospice for the care given to him and his family.